Narcissists are masters of language who use words to deceive, coerce, seduce, and mislead. They have the forked tongue of a viper and have no misgivings when it comes to spouting poisonous, vitriolic abuse at their victims. Verbal trickery is their preferred method of manipulation and they have a talent for saying the right thing at the right time to confuse, belittle and degrade the other person. They devalue their victims, purposefully seeking to make them feel worthless so that they may subjugate them to their will. The unrelenting mind games of the narcissist are incredibly damaging to those on the receiving end; they can lead to anxiety, depression, and a whole host of other psychological effects. Victims are left traumatized by the bombardment, with emotional pain that seems to have no end. They become mentally crippled by the onslaught, not understanding what is happening or how to escape from it. That’s why it is so important to educate yourself regarding the sadistic language of narcissists; only then will you be able to recognize it when you encounter it. Knowledge of their ways will help you to form a shield against their attacks and prepare you for a quick escape should you ever get lured in by one. If you have already suffered abuse at the hands of a narcissist, a better understanding of how they operate might aid in your recovery process. It might help to persuade you that you were a victim and not merely a participant in the whole episode. Whatever role you think you played, chances are you were only acting out the narcissist’s will. So, here are just some of the ways in which a narcissist will exploit language to control his (or her) victim. This is an umbrella for the almost ceaseless stream of small, almost insignificant comments that form the foundation of a narcissist’s verbal abuse. This is how they will usually begin to exert control over their victims, starting early on in the relationship when it might seem nothing more than a small flaw in their otherwise charming demeanor. Often with a friendly smile on their face, they will say things like “you’re a very sensitive thing aren’t you?” or “no, you have misunderstood what I was saying.” These are the beginnings of a much longer process to wear the victim down, but they are rarely seen for what they are because of their seeming insignificance. This sort of hidden abuse will continue throughout a relationship as an accompaniment to further, more insidious attacks. This is a form of grooming that begins to sow the seeds for the victim’s future tolerance of more hurtful abuse. They are lulled into a sense that what they and their narcissist partner have is unlike anything they have experienced before. They are misled into thinking that all the best relationships are explosive and passionate and that this is a sign that theirs is something very precious. The victim becomes convinced of this “fact” and, thus, finds it more difficult to break things off with every passing day. Another way that a narcissist will inflict their spitefulness on their victims is to constantly dismiss insults or criticisms by claiming that they didn’t really mean them. They know full well that their prey will have been wounded by the initial comment, but make their excuses to cover up their malicious intent. They say they were joking, but, in reality, they were craftily going on the offensive to maneuver themselves into a dominant position. This sort of language further conditions the victim to accept the narcissist’s behavior. It confuses them and makes them unsure as to whether or not they should be offended. Not knowing when to view a comment as an insult and when to take it as a joke simply hands power over to the narcissist to say what he likes. A narcissist has an uncanny ability to tease a person’s insecurities out of them and to identify all of the things that the other person considers as flaws. They also have a brilliant memory for such things and almost perfect timing when it comes to using them against their victims. They may even be blunt in their questioning, using the cover of intimacy and vulnerability to pull down any defenses that they may encounter. To the victim, it feels like a way to build and strengthen the bond that has so far been built, but for the narcissist, it is a way to build up their stores of ammunition for use at a later date. When the time comes, they will launch an offensive, using the information you handed over in trust to reopen old wounds and make you feel the same trauma and pain you have associated with for all of your life. The narcissist thrives on the power they hold over you and are not afraid to use it in any situation where they feel it would advance their cause. Coming across as nice, charming, and even complimentary is a skill that most narcissists have. They can lavish praise on other people when it suits them, but not a single word of it is heartfelt and honest. Instead, they use false praise to manipulate others, to get them onside, and to make the criticisms that follow more palatable. They may say things like “I like your dress, but it really doesn’t flatter your figure” as a means of softening the blow while still having a dig. It might seem like honesty, but it is anything but. The compliment is nothing short of a lie – something that they themselves don’t believe, but that serves their purpose. This is another example of implicit abuse; something that might not always seem so bad to the victim and onlookers alike, but that has a cumulative and damaging effect on the self-esteem of those being targeted. Undesirable, vile, and malicious thoughts and actions stemming from a narcissist aren’t things that they wish to see in themselves. To overcome this, these are projected onto their victim as a way of shifting the problem to someone else. They unleash a barrage of words designed to convince the other person of their wrongdoing, to bamboozle them into believing they have done wrong even when they haven’t. 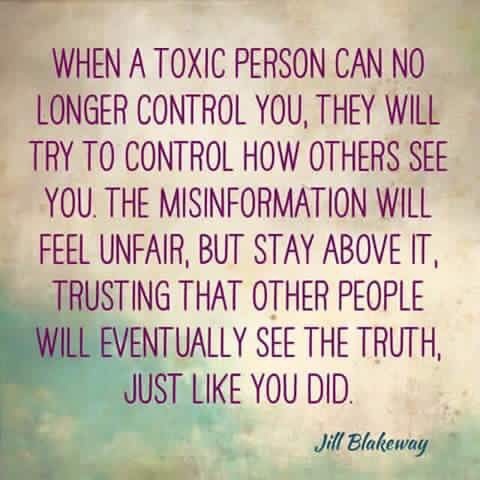 They make accusations such as “you’re paranoid” or “you’re a control freak” to mirror their own problems and transplant them into the beliefs of their victims. They repeat this again and again, with such conviction that the other person ends up thinking that they actually embody these traits or that they have actually perpetrated some wrongdoing. The more a narcissist can confuse their victim, the easier it becomes to make them bend to their will. They will set out upon a campaign of trickery and deceit that will slowly persuade their prey that they are losing their mind. By blurring the other person’s perception of reality, the narcissist can effectively write their own script and know that it will be accepted as truth. They will constantly question their victim’s memory and insist that events were different to what is being recalled. They will withhold information or manipulate the truth to create doubt and confusion in the other person. The aim is to make the victim feel ever more dependent on them and ever less likely to leave. They might say something along the lines of “thanks for taking the trash out this morning” even though they are fully aware that they did it themselves. When the other person responds by saying they didn’t take it out, the narcissist will insist that they must have done because they certainly didn’t do it, and it didn’t move by itself. A small thing, perhaps, but when this scene is repeated over and over, it can be incredibly disorientating for the victim. To maintain an air of normality, and to lay all of the blame squarely at the feet of the other person, a narcissist will insist that they never have any issues with people outside of the relationship. This further weakens the self-belief and self-confidence of the other party and makes them more vulnerable to future manipulation. Sometimes the most powerful use of language that a narcissist can employ is to pursue a silent approach. During a confrontation, they might simply choose to glare, frown, shake their head, or turn away. They may also switch the tone in which they are speaking to convey a different meaning to their words. They may speak slightly higher when on the defensive or put particular emphasis on certain words to push their agenda. These manipulations of language – and others like them – are designed to exert influence and control over the victim. A narcissist will adopt whichever approach is required to continue their war of attrition, wearing the other person down in a non-stop assault on the mind. Identifying these tactics is only the first step to overcoming them and to freeing yourself from the hold a narcissistic abuser has on you. Have you suffered at the tongue of a narcissist? Can you relate to the language described above? Leave a comment and share your thoughts with others.